Specialized German Roach Pest Control applications will not be EFFECTIVE when German Roaches have other FOOD SOURCES, and excessive cracks / crevices to hide in. 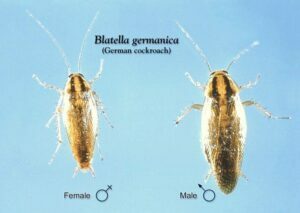 German Cockroaches must come in contact with specialized Pest Control applications for a long enough time to be eliminated. Removing other food sources, sanitizing, & good repair, are KEY to an EFFECTIVE German Cockroach Pest Control treatment! Store Food should SEALED containers… NEVER ON THE FLOOR! Clean & SANITIZE SINKS and FLOOR DRAINS. Plumbing should be kept in good repair. Sanitize all surfaces that have FOOD CONTACT. REMOVE Inoperable or unused equipment. CLEAN & sanitize all dishes & utensils after each use. Clean WALLS and CEILINGS, make sure they’re in good repair. BATHROOMS must be clean and in good repair. Make sure TRASH containers are LEAK-PROOF and have a LID ON THEM. CLEAN Outside DUMPSTERS, make sure lids STAY closed. Providing Responsible Pest Control in Phoenix, Mesa, Chandler, Scottsdale, Gilbert, Queen Creek, & surrounding areas.